Powers/Abilities: Zarmi could inflict pain on other persons simply by gazing at them. She could cause a very short solar eclipse with a mere gesture. She could also cast illusions in the minds of other persons which so real that the illusions had physical effect. (Savage Sword of Conan#112/1 (fb) - BTS) - Many of the peoples subjugated by Turan had a legend involving a prophet who would free them and lead them into a shining era after having purified the world with fire. One day, Zarmi, a beautiful blond girl, managed to gather these peoples under her command with the promise to lead them in a holy war to conquer Turan. They believed she was the prophesied one. Zarmi inspired absolute zeal in her worshipers. The influence on them was so strong that sworn enemies such as Yuetshi and Irakzai went along in peace under her command. (Savage Sword of Conan#112/1) - Zarmi led her followers into the desert to convince the Zuagirs to join to her cause: together they would set the world aflame! A warrior challenged her but with a single gaze, Zarmi had him retreat in pain. Not satisfied, Zarmi caused a brief eclipse which convinced all those still skeptical. Zarmi's horde entered Turanian territory and they slew all the soldiers of a fortified outpost on the southern shore of the Vilayet Sea. At night, a quarrel arose between some Yuetshi and some Afghulis and blades were drawn. Zarmi used sorcery against Abdul, an Afghuli. She managed to keep the different clans together. The rebels let spread a false rumor about their settlement in a valley behind the Rymra Pass. The Turanian General Orne'q fell for the trick and sent a battalion to the valley. Zarmi and her men ambushed the Turanians at the Rymra pass and killed half of them. Some days later, needing more weapons for the final assault on Aghrapur, Zarmi sent her followers to attack Fort Khenat. Even without sufficient siege machines, Zarmi spurred her worshipers to fight. The dead piled as high as the walls of the Fort so, the rebels, climbing the mountain of cadavers, swarmed into the fortress and looted it. Zarmi's agents informed her that General Orne'q had been executed and that Conan, a barbarian, was the new commander of the Turanian army. Zarmi laughed, underestimating Conan. The following night, her forces invaded Aghrapur not noticing that the main part of the Turanian army was outside the city. Zarmi's horde started looting and pillaging; even Yedzigerd had to hide himself. Murder and fire were rampant all over the town until the cavalry led by Conan attacked all the rebels gathered in the city. Outnumbered and under-trained, Zarmi's tribesmen resisted the Turanian soldiers, but eventually died in blood and fire. Zarmi did not recall them, nor she did she surrender but remained convinced of her sacred mission. Conan reached her but an arrow fired by a Turanian archer killed her. The remaining tribesmen revolted against each other, fisher against nomad, spearman against mountain goat-herd. Comments: Created by Michael Fleisher and Dave Simons (writer/plot/art). Her powers could be magic, even if she was a bit too young to master sorceries as powerful as moving the moon to cause an eclipse. A lot of priests of ancient cults were able to calculate the exact day of an eclipse, so Zarmi could have organized a gathering in the day of the eclipse to impress her followers, but without magic powers, she could not control the duration of the eclipse, which lasted only few seconds. Zarmi was the prophesied one. The world was set aflame, but the shining era lasted for only a few hours. Abdul was an Afghuli and was one of Zarmi's followers. He and other Afghulis were having dinner when a pig spilt their food. They were horrified because the swine was an impure animal for them, so Abdul extracted his knife to kill the Yuetshi responsible for the mess. 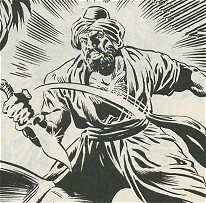 Zarmi stopped Abdul by casting an illusion into his eyes; Abdul screamed because he saw his knife as being hot and on fire and so he let it fall. Another Afghuli picked up the knife. It was cold but Abdul's hand was scorched. Derneg was a Yuetshi. His tribe had settled on the banks of the Akrim river. He was part of Zarmi's army and he was also a butcher by trade. Derneg and one of his people were ready to kill a little pig to have for dinner, but the swine escaped and spread panic and disgust in the Afghuli camp. The Afghulis considered the creature impure and a brawl began, but Zarmi punished Abdul and put it out. Numallah was a brave and honorable man, a captain in the Turanian army. He inspected the prisons and gathered some men suitable for the army. 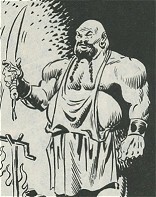 He recognized in Conan a valiant fighter and also promoted him to instructor. When General Orne'q ordered him to lead his squadron to the valley east of the Rymra Pass, Numallah suspected that it was a trap set up by Zarmi, but General Orne'q didn't believe so and ordered him to go anyway. Numallah left for the valley and the Turanians were indeed attacked in the Rymra Pass. Numallah was wounded and his troops were defeated. Orne'q gave the fault of the defeat to Numallah and the poor captain was executed. His useless death was avenged by Conan, who survived to the massacre and told Yedzigerd that the one actually responsible for the defeat was Orne'q. Orne'q was the commanding general of the Turanian army. Orne'q was not able to defend the Turanian Empire against the quick raid of Zarmi's forces. He asked for more soldiers and Yedzigerd gave him leave to enlist criminals from the prisons. Pressed by Yedzigerd, Orne'q did not care to send a battalion led by Captain Numallah in a place for a perfect ambush, only to verify a rumor about one of Zarmi's contingents. Several days later, the Turanians entered the dangerous Rymra Pass and were in fact ambushed. Half of the battalion was annihilated, and they were defeated. Orne'q placed the blame for the defeat on Numallah and the poor captain was executed. That night, Conan sneaked into Yedzigerd's room and told the king the truth about Orne'q's incompetence and warned Yedzigerd about Fort Khenat. The barbarian then fled. Several days later, Orne'q had not sent any reinforcements to Fort Khenat, believing the rebels too disorganized to assault a stronghold like that. Instead, Zarmi built a stairway of corpses and conquered the Fort and all the vast weaponry inside. Yedzigerd later had Orne'q's head impaled on a pike, then put Conan in his place as the Commanding General of the Turanian Army.